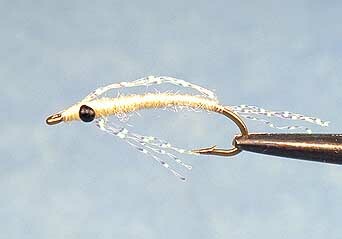 According to Engle ("Fly Fishing the Tailwaters") the Mysis relicta is the sole freshwater relative of a saltwater shrimp which became stranded inland after the last Ice Age. They were stocked in the 1950's in Colorado reservoirs in the belief that they would support populations of Kokanee salmon and lake trout. Unfortunately the researchers didn't realize that the evidence they relied upon for this theory was misplaced and that in the Colorado lakes the mysis was not visible to the salmon during day time. Nopt liking sunlight, they moved to the bottom of deep lakes during the daytime when the salmon feed on the surface. Worse still at night the mysis moved back to the surface to feed on the Daphnia zooplankton which was a food source for the kokanees and trout denying them a food source. The only trout which benefited from the introduction of the mysis was the lake trout, a deep water feeder which reached the depths where the mysis were located in the daytime. However in bottom release dams with deep cold waters such as Reudi, the mysis are sucked out into the tailwaters where they become visible in the daylight permitting the trout to gorge themselves. 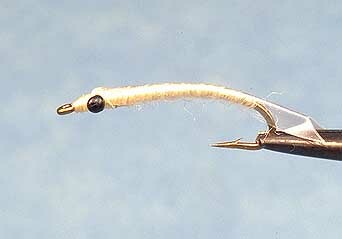 There are a number of mysis patterns noted below which work well. The healthy mysis are translucent. As they die they turn white, so when fishing near the outlet of the dam, fish the more translucent patterns as the mysis which have just been expelled from the dam will not immediately turn white. The whiter patterns work better a little away from the outlet. The mysis shrimp has an exceedingly high nutrient value accounting for the massive growth in the trout that are able to feed on them in large quantities. Fishing Techniques. One can either fish blind or sight fish. If the fish are in deeper holes and not visible, sight fishing will not be an option. 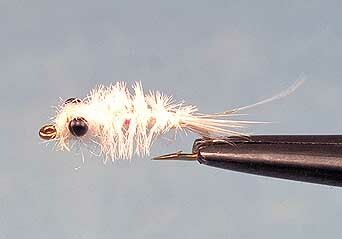 The difficulty with fishing mysis is that the trout generally wait for the mysis to drift to them. Therefore the takes are very gentle and almost imperceptible. Like a wrestler on steroids, the large fish require a large diet so they are feeding as often as they can. A fish feeding on mysis will take other nymphs carefully presented to them if the conditions suit. Therefore the best approach is to minimize drag and interference and try and watch the line as closely as possible. Any irregularity in movement should be taken as a strike. Use light tippet and a very light strike indicator. If you can see the fish, watch for the smallest movement which corresponds with the fish taking a morsel which has drifted into its mouth.